Landice treadmills are exceptional machines. There is no doubt that this company has perfected the concept of treadmill design by keeping their focus narrow. They make a limited selection of treadmills, exercise bikes and ellipticals, and they make them better than just about any other company around. You’ll pay a price for this kind of quality, but the company makes it a pleasure to do so. For over forty-five years they’ve been supplying health clubs with treadmills, and Landice now offers several options for home use. They’ve kept all of the features that make their club treadmills so popular while tweaking the specs to tailor their home use treadmills for better individual, in-home use. Landice treadmills are made in the USA with the highest quality components available. The company doesn’t skimp on anything from nuts and bolts on up. The motors are Baldor motors, known for long life and for running cool under even the most stressful situations. One of the best features of these treadmills is the aircraft aluminum frame, which is lightweight but incredibly strong. All joints are of aircraft locking hardware instead of welds to minimize fatigue and breakage. Landice has also developed a liquid steel molded flywheel that provides maximized inertia with less weight. There are only two models currently: the L7 and the L8. The Landice L7 features a 4 HP motor, four-ply belt, up to 12mph speed. up to 15% incline, a 20" x 58" running area and a 400 lb. max user capacity. The Landice L8 has all of the features of the L7 plus a larger 22" x 63" deck and a 500 lb. max weight capacity, as well as upgraded design and features. Both models come with an entertainment center, VFX shock absorption and four console choices: the Executive, the Cardio, the Pro Sports and the Pro Trainer, each offering different features. With USA made parts, you also get an amazing turn-around if you ever need parts, but this is rare. With parts that are custom designed specifically for Landice treadmills, you’ll find that friction and wear aren’t issues. On the very few occasions you might actually have to contact Landice customer service, the company’s support people will treat you like gold. Focusing on nothing but treadmills has served Landice well. They know what runners want and deliver, from wider, 4-ply belts for comfort and less “grab” to one inch decks for stability and impact absorption. Landice treadmill reviews consistently highlight these machines as designed with true fitness devotees in mind. They are superbly designed and the warranty is a thing of beauty – lifetime on all parts, with a fitness legacy that allows owners to pass the warranty on to heirs along with the machine. Now that’s confidence! Landice L7 - an award winning commercial-grade treadmill with four console choices, strong motor, incline and workout programs. Landice L8 - a step-up model with a larger deck designed for runners and taller users. Landice L770 Home ProSports Trainer - The best home fitness treadmill money can buy. Superior construction and a lifetime warranty make the L770 a solid investment. 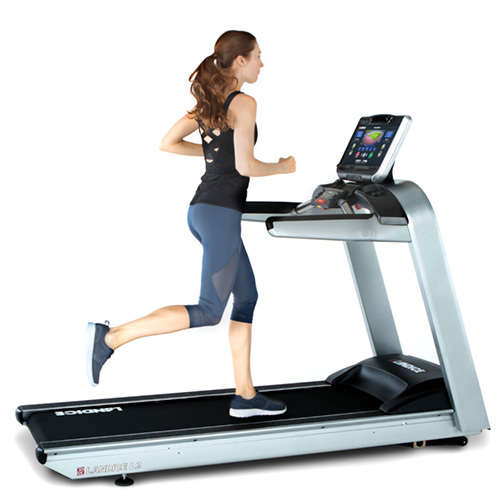 The Landice L870 Home ProSports Trainer - An exceptional home treadmill covered by a lifetime warranty. The Landice L9 Club ProSports Trainer - An overkill for the average runner?